How to survive in the jungle? No doubt, this is one of those questions that will leave you asking yourself, ‘Why in the world would I be away from my cozy pad and out in the wild?’ Good question. However, you can never tell how life turns out, right? For example, you could be out on an exotic cruise only to have the ship develop a mechanical fault. This means berthing at the nearest jungle island is unavoidable. Even planes sometimes have to make emergency landings; and if the jungle is the nearest stop, well, so be it. And just like the television series ‘Lost’, those survivors really needed all the skills known to man to make it out of the jungle alive. Regardless of whichever way you find yourself in the jungle, even if you are out there voluntarily, one thing becomes clear; you need survival skills to handle the leafy labyrinth without becoming an anaconda’s lunch. And if you are one of the fortunate ones to get stuck with a cutie for the company, regardless of the threats that are faced or the romance that occurs, the following tips will ensure you both stay in great shape, just like Tarzan and Jane. Working on the assumption that you are out in the jungle voluntarily, be sure to pack the right gear in your survival backpacks to avoid unwanted occurrences. With the laundry list of dangers in the jungle ranging from wild dangerous animals, creepy crawlies, poisonous bugs, and insects, you need to be carrying some form of protection. 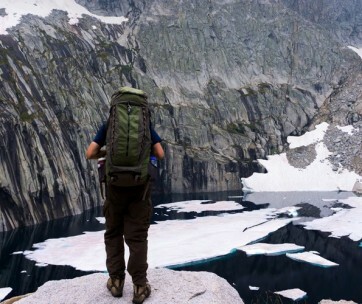 If you are fortunate enough to still have your smartphone with you with some power left and a hiking or survival app preloaded on it, you are in luck. 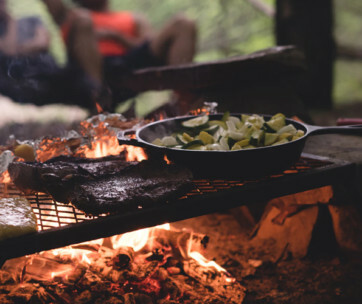 Survival apps are a good way to get quick tips on what foods are safe to eat, what to do in the event of injury or when confronted by a wild animal. Don’t get too dependent on them though. Once your battery goes out, you could be left in the lurch. 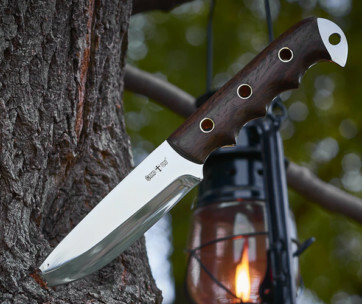 Having a survival knife is also key. With a survival knife in hand, you can fearlessly slash a path for yourself through the lush foliage. It also makes cutting small fishes for eating a piece of cake. You can even use it to make a walking staff from small branches or a spear from bamboo stalks which you can use for taking jabs at fishes. And should you get charged by a puma or a baboon, a survival knife can really come in handy in putting up a fight for your life. Be alert though; you can only defend yourself when you can see the danger in time. Also don’t forget to keep a survival watch handy, along with a compass to make it in good time towards rescue (if needed). 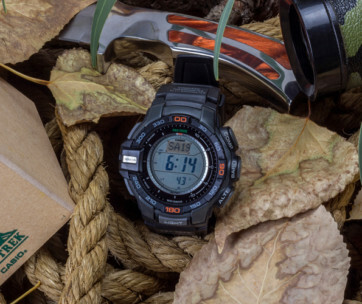 Your survival watch will help you know how many hours of the night you have left before you have to break camp. With the leafy canopy shielding you from sight, everywhere looks very much alike, which can cause you to lose your bearings while ending up going round in circles. When out in the jungle, it’s vital to keep in mind that strange and unnamed insects, snakes, and all sorts of creatures await your tasty blood. So stick to long-sleeved clothing that offers the best protection. At the end of each day, be sure to wash and dry your clothes before nightfall. Dirty clothes only make you more susceptible to infection and possible illness. As it also rains a whole lot in the jungle, a good rain jacket and a pair of tactical pants is a must. Remember that tropical climates come with a rainy season; the perfect time for torrential downpours all day, every day. However, don’t be tempted to pack too many sweaters; the rain that comes is often very cool and short lived. And once it dries off, the sweltering heat returns with a vengeance. So loose-fitting, organic cotton clothing will be perfect for such an environment. Remember to also pack a pair of sturdy, hiking shoes which are much needed to keep you trooping through the canopy of lush, dense foliage the jungle is known for, along with hiking socks. They will not only keep your feet comfortable, but they also offer a safe hideaway from exposure to moisture, poisonous plants or bites from creepy crawlies. Seeing that humans can last almost a month without food, yet only a week without water (or even less in the broiling heat of the jungle), your life depends on staying hydrated. Your water supply will only last so long, so the ability to find water in the wild is required to avoid getting parched. Luckily, with all the rainfall that takes place in the jungle, finding water isn’t too hard. By using large leaves as a funnel, the rainwater can be gleaned into a container for storage. However, this technique can be pretty tricky and time-consuming for gathering large amounts of liquid for portability. This will mean that clean and natural water sources like streams, lakes, ponds or rivers are your best bet for easy water filling. Start by following animal tracks which are often easy to identify by their footprints. Once a good water source is identified, assume that if animals regularly drink from there, then such water can be considered safe for human consumption. Worried about the particles floating around in the water? Use a clean cotton shirt as a sieve to filter the water, if you don’t have a filtered water bottle handy. However, if you have a sensitive stomach, and you are often prone to stomach bugs caused by foreign bacteria, coconuts, especially when large and still green are chock full of tasty water. Even though you technically can still be alive for weeks without food, that is not a route you want to go down. Out there in the wild, when pitted against nature and predators, this is not a good time to get weak. Food provides strength so be sure to eat as much as you can. Now don’t go daydreaming about steaks and baked potatoes dripping with warm butter. You are out in the jungle and if you don’t have a survival food kit, there is a rich abundance of local and organic food. You just have to be careful not to poison yourself in the process. So stick to familiar fruits like bananas, mangoes, berries or anything else you recognize. But in all cases, avoid mushrooms!! Better still, you can use monkeys as a ‘safe to eat’ meter as they are the closest species to humans. If a monkey eats it and doesn’t keel over, you can too. You can even try catching fish, which is a great way to make that trip to the stream for water totally worth it. 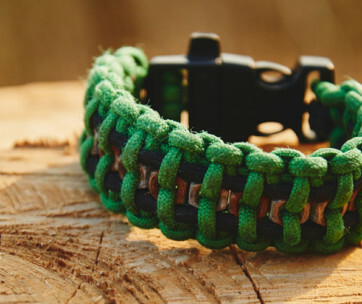 Simply use your paracord bracelet to fashion out a fishing tackle. However, if you are not feeling particularly patient, you could create a makeshift harpoon using long bamboo stalks. Next, pick a position overlooking the stream where you can quietly watch for fish then strike when they move within range. As much as you might have the best survival skills, the truth is; the jungle is not only a dangerous place to be, but it is not even a natural human habitat. So the sooner you get out of there, the better. The thick canopy makes it appear dark sooner so it is wise to keep moving, making the most of the daylight hours. As nighttime is a prime hunting and feeding period for many predators, you don’t want to be out and about then. Hence why we advise to make the most of the visibility offered during the daytime with continued movement. The possibilities that, when you are lost, movement in the right direction brings you back to civilization or rescue faster. Better still if you are able to find a water source, the rescue could be at hand as a village or settlement likely would be close to it. If your paracord bracelet is the variety fitted with a compass, it makes it far easier to figure which way to go to locate some locals. As you remain on the move, make sure to rub mud all over your exposed arms to prevent mosquito bites. Leave broken branches along your trail and place rocks strategically as you move to make it easier for rescuers to track you. Food, clothing, and shelter; these three aspects are the basic needs for human survival. We’ve already covered food and clothing, but shelter in the jungle is no five-star experience. Your grossness reflex needs to be on the utmost suspension in the great outdoors while your jungle smarts take center stage. Make sure to get set for the night before it actually goes dark. Yes, you need to keep moving during the daytime, but you also need to work smart. If you don’t have an emergency blanket in your backpacking backpack, this is the time to get your survival knife out and start chopping. Bamboo and small branches are the best materials for crafting out a temporary mini-hut or ‘lean-to’. Remember that, out in the jungle, less is more and there is no time for perfection. Start by seeking out a clear and dry spot between two trees to set up your lean-to. It should look pretty much like a teepee used by the Native Americans except it is made with leaves and narrows down towards the end rather than remaining a full triangle. The trees will not only serve as support but also protection from strong winds. Make sure your bedding down spot is on high ground to avoid contact with settled rainwater or insects while you rest. Spread out dry leaves to lie on, that way your body is not in direct contact with the ground. It goes without saying that the jungle is full of all kinds of predators both crawlers and those above ground that can easily strike within seconds. Being too distracted could literally cost you your life, so you need to keep your wits. Be on the lookout for snakes and deadly insects, assuming that everything that comes in close contact. Out in the jungle with no hospital close by, is not the time to experience insect inflicted dengue fever or to struggle with extracting snake venom. Also, try not to be too noisy when fumbling about in the wild. Though being loud can keep some animals away, it could also startle others leading them to launch an attack on you, a perceived aggressor. Balance is the key. Not too loud yet not so quiet that you and a black mamba end up unexpectedly in each other’s faces. Chances are you wouldn’t win that duel. Additionally, the dense foliage of the jungle is an excellent camouflage for cunning animals like the puma. So cast your gaze wide and look above you also for any dangerous animals waiting to pounce. A fire is a must have in the jungle. The uses of fire for survival are multidimensional; not only does it keep you warm, but it also offers an excellent way to keep insects away and scare away wild animals from your sleeping point. Even though the days are rather hot in the jungle, nights can be surprisingly cold and catching a cold can really slow you down. And with a fire lit, you get to stay warm whilst grilling some of that fish you caught in the stream. To make a fire if you don’t have a firestarter, start by gathering some food for fuel such as dry leaves and faggots. Fresh leaves cannot sustain a fire, so don’t even bother with those. Also, collect a few stones to form a base for the fire. Once done, the next step is to identify a dry spot which is a safe distance away from your shelter, then place the stones you collected lined up to form a small circle with the dry leaves and faggots in the middle. 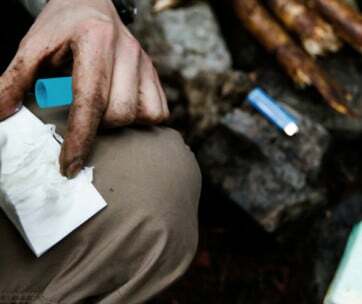 Next, use the dry sticks to form a mini teepee which would allow oxygen in to feed the fire. Once all is arranged, it is now time to light that baby up! Strike a stone with a piece of flint repeatedly until you get a spark. Once the tinder catches on, blow gently to spread the fire. Remember that fire safety is as important in the jungle as it is out of it. Keep your fire small and controllable. You don’t want to start a wildfire with animals scampering for their lives in all directions. And don’t forget to use some sand to put out your fire when leaving your camp. Armed with the seven tips above, you will be navigating that jungle like a pro, Hopefully, your being out in the jungle will be for adventurous reasons and not due to tragic circumstances.